Mopho x4, Analog Synth from Dave Smith Instruments. TSP-POINT29 Studio's review (This content has been automatically translated from French)" Analog analog !!!" 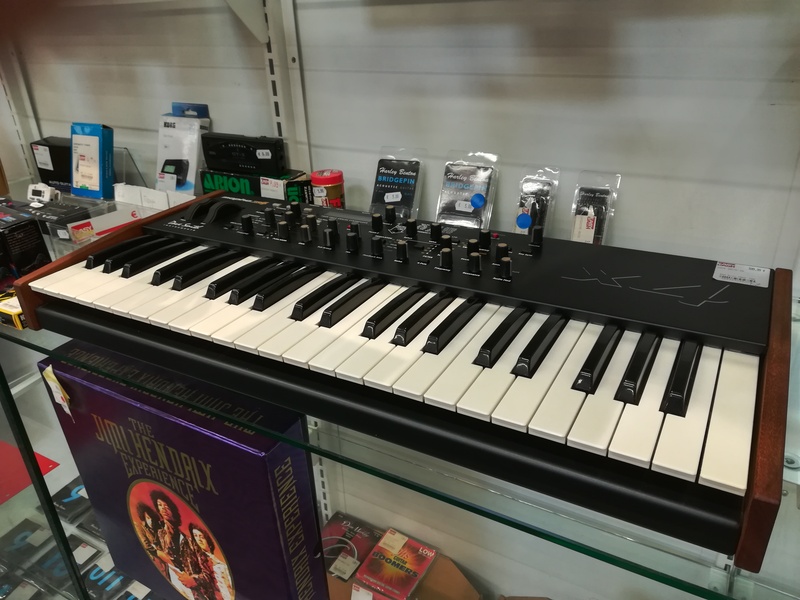 Will Zégal's review (This content has been automatically translated from French)" Excellent machine easy first"
Stereo output, headphone output, MIDI pair, a "Padal / CV" input, a sustain pedal input, USB to MIDI IN / OUT (no audio), taking "polychain" to chain several DSI synths. Something is missing? Maybe an audio input. And effects section. With virtually all the controls available directly in front, the Mopho X4 is very simple for anyone who knows a little synthesis. Reading the manual is still worth a shot, as most of the time. To my knowledge, the manual is in English. > The sounds they suit your style of music? Priori suitable for a wide range of music. The question is silly, besides, if we do not specify the style of music performed. I think this synth can find its place in all genres. No. It's his summary, not a sample bank. > The effects are they effective and responsive? > The expression is good? (Response to velocity, aftertouch)? Yes. The keyboard, however, is a bit disappointing for a synth of this price. The first time I unwrapped just after purchase, I was not home. I had a headphone with me, I plugged in and tried. I scrolled presets and I paid the banana most sounds. The radius of weaknesses, I think the 4-pole filter lacks a bit of character. I also like the sounds a little dirty, a little grimey and I think the Mopho, they tend to turn a bit sour, like a bad distortion. Everything is relative, right, but I prefer the Mopho in hot fat and that "dirt" or acidic tones. > How long have you use it? > What is the particular feature you like best and least? - Organization of presets in banks, it's great nawak it seems that Dave has 504 presets in a bag, shook it all up and dump it as it came within 4 factory banks. It's a shame when one seeks her where to go. > Have you tried many other models before buying it? This is my first personal analog. Previously, I used analos of buddies or my digital synths. > How would you rate the quality / price? Mopho X4, advised by the friend Synthwalker after analyzing my needs, fits perfectly. If I were to change it, it would probably be a Pro 2 (still with DSI) that not only sounds great sound, but also seems to be well thought out in the middle of a full configuration. For now, when some other priorities are settled, I probably adjoindrai him MiniBrute seems to me an excellent addition, despite the difficulty of integrating a synth without memory in my current group. revega's review (This content has been automatically translated from French)" A must!" The MophoX4 came out just before the Prophet 12 and mark a point more in the category of analog poly with DSI. Easy to use for novices and a little knowledge synthesis is never wrong because the manual will give you any info in this regard. But know that it proves very didactic as its architecture is logical. For others, the dashboard is more transparent and is going fast enough to navigate. The manual is in English only and is useful only for some hidden (Clock Divide example) functions. Editing sounds is a breeze. For sound we are in, very analog and powerful. 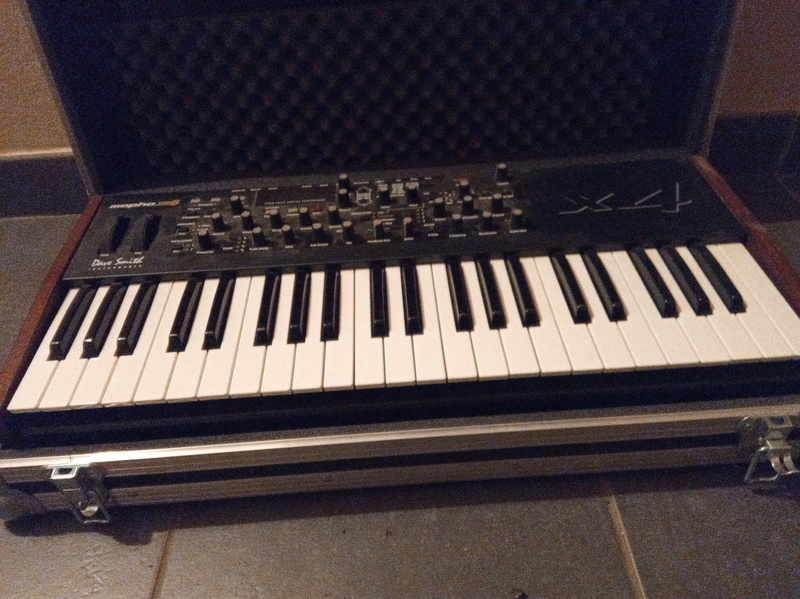 For the most seasoned and well we can say that we are closer to the atmosphere Sequential Circuits, there is a very distinctive sound Prophet, it is quite obvious. Beautiful expression with aftertouch everything nice. Two COD, a sub and a filter has 2/4 pole and there was a gross and very present analog. No effects and somewhere better as it is rare that it works on synths. As using an external rack. It is capable of nice bass, lead expressive, well dressed FX, complex sequences and nuanced atmosphere. Briefly it can go far, very far. In addition there is strong or MophoX4 is at its sequence (the arpeggiator is basic but useful). Typically with 4 programmable analog lines 16 steps. One program is assigned, it changes the clock divide and there .... That's great. And again we say that memory is still not negligible for this type of machine. Because modulation possibilities are such that it would be difficult to find them every time. There is then a standalone tool capable of simple or complex sequences and especially with the possibility of modulation / routing amazing enough for a synthesizer. Polyphony 4 way is certainly minimalist but significantly increases the possibilities of games compared to Mopho mono. Purchased after my enthusiasm for the Mopho mono (yellow) this version 4 lanes is no exception to the rule ISD. It's simple, well thought out, it sounds great, the synthetic possibilities are enormous and the quality of workmanship. What more? One would have hoped but it would have a MophoX8 ogled too closely on Prophet08 that, from a commercial point of view, would not have been seen. After 6 months of use I can only delight me to have this Mophox4. Because today a 4 analog channels with memory, sequencer, midi, portable and affordable you know a lot? I do not. The value for money is excellent in new and even better in secondhand. 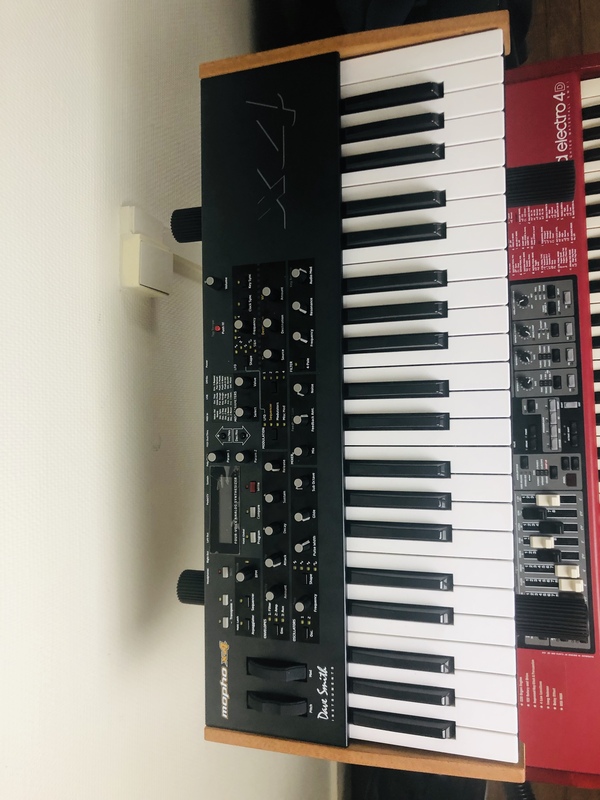 I can not find him no competition except in the same school with the DSI Prophet 08 that does not sound at all like the Prophet 12 (very different again at his level, no sequencer and not the same budget) or the PolyEvolver (anymore). 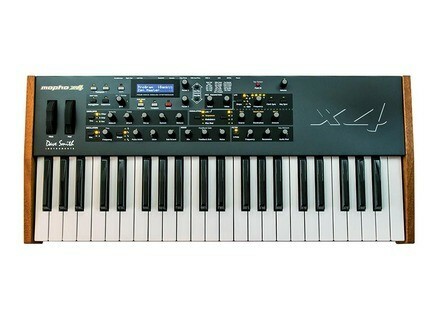 In short, the MophoX4 is an excellent keyboard personality well said, autonomous and super reliable. A must. 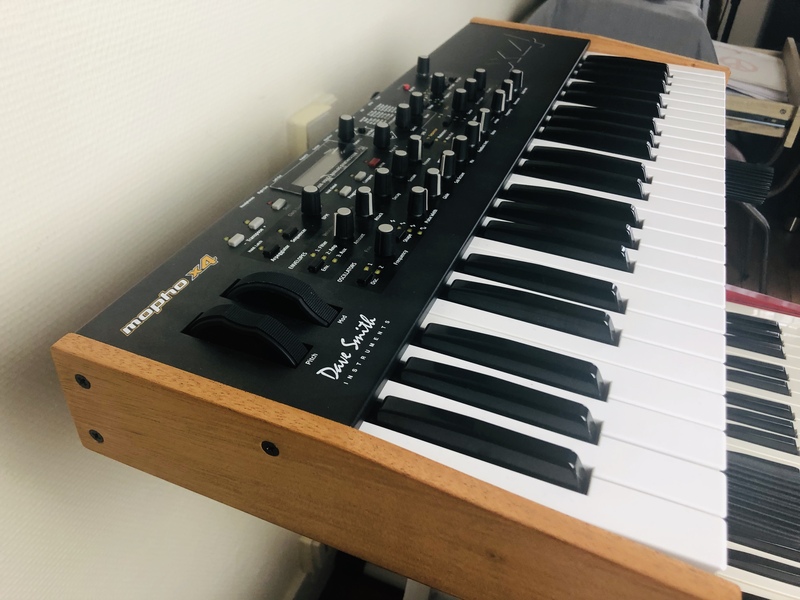 nowhershangsa's review (This content has been automatically translated from French)" A good start"
4 analog synthesizer tracks, refer to the DSI website for technical specifications. Config ultra clear in a few minutes, we understand the logic of the synth, it has almost everything at hand. It is a function button (last two with the shift key). I found it very nice to get sounds with. The manual is succinct but clear, even if it is in English. The issue is simple if subtractive synthesis is known. The factory sounds are not bad, but you do not buy a synth presets to use I think. They are quite varied in any case. No effects except for a feedback. We can make the old tablecloths, atmospheres to carpenter, arpeggios cool and demented sequences, these are the sounds I like. Otherwise faux brass and rhodes is not my thing. My goal is to make percussive sounds with, for now I galley. Level of "low" output rather, it is a bit annoying. I then used the past two weeks notice should be used with caution, but there must be a first. I have a waldorf pulse (a killing) but nothing good to see what is mono, poly as I frequently use the microkorg, C virus, ms 2000 as the single MS 20, SH 101, SE1X. I rapprocherai sounds and use of the morpho C virus, I do not perceive well the analog side, but it will come I hope. We can do some pretty fat sounds but it is not the role that I will give him, I think the other aforementioned mono do 10 times better. By against groundwater, atmosphere, effects are really fun to create. The least: output level a bit feeble, no volume control of separate oscilloscope, it is a mix knob and I do not not like it, an editor very clear to the management of banks. And especially the negative is for the game not fully configurable keyboard (note the higher or lower ...) and it fills me harsh on a keyboard of this price. With experience, I'll have a studio electronics code if I could afford it . No, of course I do it again the same choice because attractive price performance ratio, and the code it will be in another life!